The Xbox 360 may have outsold the PlayStation 3 in the seventh generation console wars, but in the eighth one, the PlayStation 4 is handily beating its competitor from Redmond, the Xbox One. In fact, the PlayStation 4 is outselling the Xbox One by almost 2:1 worldwide. It’s definitely not good news for Microsoft, and in an attempt to increase sales, they’ve cut their console’s price by 50$ across the board. For now the price cut is US only, but it could translate to other regions pretty soon because of the upcoming holiday season. Considering the fact that November will see the release of one of the biggest game deals of the season, the Halo Master Chief Collection, which has Halo 1, 2, 3 and 4 as well as access to the Halo 5 Guardians beta and Halo Nightfall, the webseries. On paper the price may be 349$, but we’d say it’s actually lesser than that. Even the starting bundle comes with a game (or two!) so effectively you’re getting the console for 300$, which is a fantastic deal, whatever way you put it. 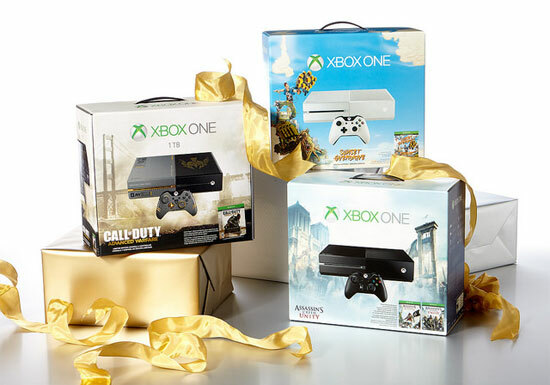 There’s 4 console bundles available, all of which come with free games. The regular Xbox One without Kinect will also be available for 349$, but with these bundles, we’re pretty sure no one’s going to buy just the console! Speaking of bundles, these aren’t just the regular consoles either, the Sunset Overdrive bundle includes the gorgeous white Xbox One, which some might remember was the special developer console color. The Call of Duty: Advanced Warfare bundle, on the other hand, includes a limited edition design console and a 1 TB HDD instead of the stock 500 GB one. Interested? Here’s details of each bundle and where you can buy them! Those are pretty sweet deals, we think, and while the Xbox One may be far behind in sales to the PlayStation 4, this will help close that gap a little bit at least. Some of its so called killer apps are still yet to come, but if you’re looking for a game console to buy this holiday season, there’s nothing that beats the value offered here!